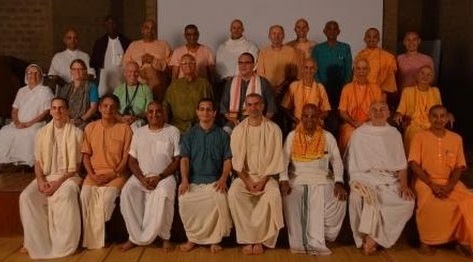 The independent film 10,000 Saints, which includes scenes shot in the Manhattan Hare Krishna Temple “The Bhakti Center” and features ISKCON devotees, was released on Blu-Ray, DVD and streaming services on October 6. Kanpur, UP: On October 3, their Lordships Jagannatha, Baladeva and Subhadra rolled down the roads of Old Kanpur, India, with hundreds of devotees dancing, with all grandeur. During the World Peace Forum meeting on October 2-3 in the European Parliament in Luxembourg and Germany, the topic of discussion was the current refugee crisis in Europe. On the second day of the conference ISKCON-guru Sivarama Swami gave a video-presentation about ISKCON Hungary’s response to the refugee crisis. He spoke about his personal experience of being a refugee himself, fleeing Hungary during the 1956 revolution, then talked about his recent encounters with Syrian refugees, as well as elaborated on the Bhagavad-gita’s teachings relevant to the situation. Sochi, Russia: Construction is set to begin on a new dayschool gurukula near Sochi, Southern Russia sometime this spring, with plans to open in September 2017. The gurukula is planned in Baranovka, a small village 15 kilometers from Sochi City Center, which devotees have dubbed “Balaramovka.” The devotee community there, started by the late leader of ISKCON’s Shastric Advisory Council Purnachandra Goswami in 2009, consists of about fifty devotees. Meanwhile the nearby Sochi ISKCON community is about 200-strong with many children. The gurukula will be built on a recently donated half-acre plot 100 meters from the Baranovka ISKCON temple. Govardhana Ecovillage, near Mumbai: The first group of participants to GBC College for Leadership Development completed the second residential session, thirteen days of training and association. 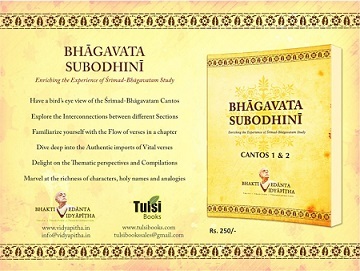 Mumbai: Bhagavata-subodhini is a study guide for the Srimad-Bhagavatam. It was originally a part of the study material for the students at the Bhaktivedanta Vidyapitha at Govardhan Eco-village, near Mumbai. The students and teachers, who are mainly the resident devotees, also contributed to various content materials that are presented in this book based on their years of study and understanding of the Bhagavatam. The book was released by Jananivasa Prabhu, the head pujari of ISKCON Mayapur, at ISKCON Chowpatty.